Splatoon Has Changed a Lot. Splatoon Hasn't Changed at All. Splatoon has come a long way since it was released last May. We’ve gotten tons of new weapons, plenty of new stages, and a good mix of new modes. I haven’t played Splatoon since ranked matches were added so imagine my surprise when I jumped back into Splatoon just to find the game hasn’t changed much. Now I love me some Splatoon. Nintendo’s multiplayer shooter is probably my favorite competitive game of this generation. It’s a game playing smart is just as important -maybe even more important- as twitch shooting. It’s a tactical wonderland, and that’s what I like in my shooters. But here I am months later my last game and I can’t help but feel Splatoon isn’t offering me something it wasn’t offering when I last played. There’s a mini-gun and a bucket now. That’s cool, but I’m still using my wonderfully OP Aerospray fending off my millionth leaping roller. There are tons of new clothing items, but my current gear is already gives me the bonuses and awesome style I want. And Japanese players are still the scariest thing in the game. The two most significant changes are ranked mode and the new maps. Ranked mode provides a few modes that are a good distraction from Turf War. The problem is these modes are behind ranked matches, which don’t hand out rewards as consistently. Which is a shame because most of the maps live and die by the new modes. Camp Triggerfish is a pretty boring map until the last minute, except when it’s played in Splat Zones. Moray Towers is a mess in any mode but Tower Control. So far the only new map I enjoy in Turf wars is Bluefin Depot because it’s one of the few maps where the two teams don’t end up fighting in a single middle point. It’s a shame I still can’t choose what stages I want to play. And that is how I feel about most of the updates for Splatoon so far. It’s seems each step forward is either small enough not to matter or held back by some other weight. The game that was so fresh at launch is still largely the same game it was at launch. The new stuff is just that: new stuff. The new stuff isn’t necessarily better or game-changing, just new. So here I am with my level-19 inkling playing Turf War with the same weapons against the same players with the same gear. Games still tend to be lopsided when tallying the final score, matchmaking still isn’t perfect. But even though the game I’m playing isn’t really all that different, it’s still a hell of a fun time. It is still the game I know and love a few months ago. 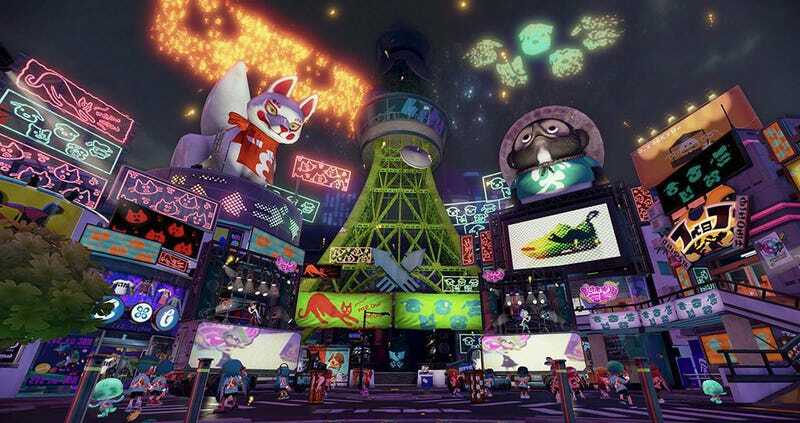 But for a game that is so focused on freshness, Splatoon is going to have to do more than the occasional weapon and map update to keep people interested in the long run.